This year’s International Women’s Day theme is #PressForProgress. It’s a strong call to action to collectively push harder for gender parity. In the spirit of this important campaign (which everyone should consider a year-long project rather than a single day of mindfulness), I take a look at the new factors holding gender equity back in the workplace and how leaders can push harder for progress. Despite the considerable attention on women’s rights and gender equity, and the strong support of movements such as the Women’s March, the World Economic Forum’s 2017 Global Gender Gap Report has found that global gender parity is still over 200 years away. This is echoed by 2017 gender data from the Visier Insights database, our unique database of anonymized, standardized workforce data. We found that the gender pay gap widened in 2017 rather than becoming smaller. In 2016, women made 81 cents to the dollar, but in 2017, women made 78 cents to the dollar – that’s 22% less than men. Gender equity is an issue of incredible focus and debate for employers and lawmakers, particularly when it comes to compensation. Research shows that gender diverse companies are more likely to outperform their less diverse peers, and a lack of a gender diverse workforce can also impact employer brand. So what’s holding up progress? Establishing an equitable pay policy is an important step forward, but the gender pay gap is more than a compensation issue. Let’s examine the workforce gender equity factors impacting this disparity. 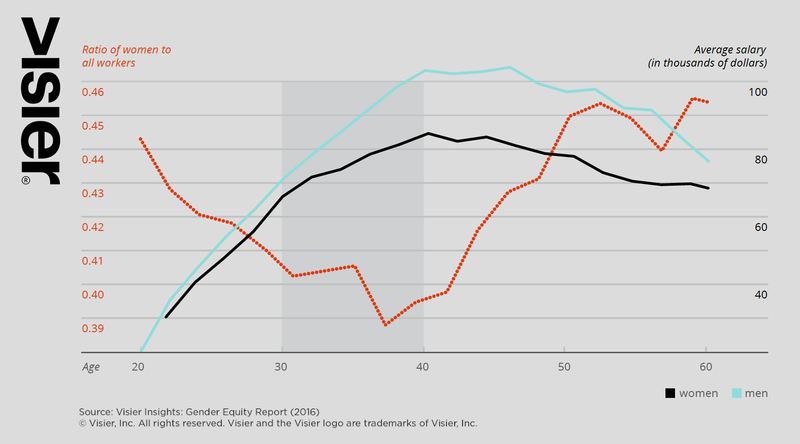 In our Visier Insights: Gender Equity report, we uncovered the Manager Divide: a growing underrepresentation of women compared to men in manager positions from age 32 onwards, which is also the age at which the gender wage gap begins to widen. 2017 data from our database shows that when comparing the performance ratings of men and women, female managers are 24% more likely to be high performers than their male counterparts–yet female employees are 33% less likely to become managers than male employees. By eliminating the Manager Divide and ensuring gender pay equity in manager positions would reduce the gender wage gap by almost one-half for workers over age 32. In examining the Manager Divide, we found a strong correlation to motherhood. As female representation in the workforce drops, the gulf between the proportion of men who are managers and the proportion of women who are managers grows wider, stabilizing only after women’s childcare demands lessen (typically after age 39). This is echoed by a 2018 study by the National Bureau Of Economic Research, which found that women’s earnings declined sharply after the birth of their first child, while men experienced no comparable salary drop. The study also looked at the earnings of women without children and found that it stays quite similar to men’s salaries, which shows that the gender wage gap may actually be more of a childbearing pay gap or rather, a motherhood penalty. While the motherhood penalty is an important challenge we need to overcome, both women with and without children still face many of the same gender equity issues, such as gender bias in performance reviews, which directly impact their promotions and compensation. In 2015, 90% of new CEOs in the S&P 500 were promoted or hired from line roles — and 100% of these executives were men. Furthermore, the McKinsey and LeanIn.Org study, Women in the Workplace 2017, found that women are 18% less likely to be promoted to manager. Furthermore, Visier Insights data shows that despite women being more likely to achieve top performer ratings, men under age 40 receive more promotions than women (over age 40, however, this trend inverts, with women receiving more promotions than men). An individual’s contributions to the organization should typically be the primary factors used to determine promotions and salary raises; however, McKinsey found that while 93% of companies report they use clear and consistently applied criteria to evaluate performance, only 57% of employees report managers actually do this in practice. When performance management practices are unclear and unstructured, it opens up the possibility for unconscious biases to creep in. Researchers at Stanford University’s Clayman Institute conducted an analysis of the language in hundreds of performance reviews and found that women received 2.5 times the amount of feedback men did about aggressive communication styles, with phrases such as “your speaking style is off-putting.” Women were also described as “supportive,” “collaborative,” and “helpful” nearly twice as often as men, and the women’s reviews had more than twice the references to team accomplishments, rather than individual achievements. On the other hand, men’s reviews had twice as many words related to assertiveness, independence, and self-confidence. Men also received three times as much feedback linked to a specific business outcome, and twice the number of references to their technical expertise. In response to the research, Caroline Simard, director of research at the Clayman Institute, said that such hidden biases could ultimately lead to “cumulative disadvantage over a woman’s career over time, resulting in lower access to key leadership positions and stretch assignments, advancement and pay,” Simard added. The gender wage gap cannot simply be explained as “unequal pay for equal work.” For example, if a company pays women and men the same for equal work, but then underrepresents women in the better-compensated manager roles, that company has not achieved gender equity. Rather, gender pay inequity is a systemic challenge where women as a whole earn less than men on average, and do so across education levels and occupations. Start with simple metrics like “female ratio” (looking at the percent of total headcount that are female) by department, role, and/or location, and in your hiring pipelines. Once you know the state of your gender equity, dig deeper into the data to find out if pay and performance ratings are unbiased for men and women. Compa-ratio is a classic compensation calculation that indicates how close a person’s base pay is to the pay level midpoint for the role they perform. If women have a lower than average compa-ratio, then it is likely that pay decisions are not being made equitably. Similarly, understanding the proportion of employees who receive each level of performance rating and then comparing this to the proportion of each rating for female employees will uncover if performance ratings are handed out in an unbiased manner. Many U.S. cities and states are considering measures that prohibits employers from asking job candidates for past wages or salary history. The purpose of these rules is to help women get out of the cycle of earning lower wages from their first jobs and throughout their entire careers. The practice has already been banned in Oregon, California, Massachusetts, Philadelphia, Delaware, New York City, Pittsburgh and New Orleans, with more expected to come this year. If your company isn’t already complying with this practice, don’t wait for it to become law. Start working with your leaders to implement hiring and compensation strategies that enable your female employees to receive more equitable pay. Measure not only promotions by gender, but also the nature of the promotions: by role, department, or location, find out if the percent of women promoted to or holding manager positions is lower than the percent of men promoted to or holding manager positions. Leadership development can help more women rise higher in the ranks, especially mothers who are coming back to work after having their children. Research from The Conference Board and DDI found that while a leadership development program will be equally effective at improving the skills of both men and women, 82 percent of women reported their confidence in being a leader increased after participating in a development program (lack of self-confidence can also be considered a significant factor holding women back from career advancement. Given the negative impact of the motherhood penalty, look into ways your organization can better support paid parental leave. It should be equally available to mothers and fathers, and be socially acceptable not just for mothers, but also for fathers to take. Flexible working time arrangements could also be a key part of your solution. Make the business case for gender equity at your organization, but remember this isn’t just about fairness, avoiding lawsuits, and protecting (or building) your employer brand (check out the InHerSight for an idea of what the future holds — a Glassdoor-type site that focuses on rating companies from the perspective of their support of women). Research by McKinsey shows that companies in the top quartile for gender diversity are 15% more likely to have financial returns above their respective national industry medians. According to a 2016 McKinsey Global Institute report, if full gender equality is attained, $4.3 trillion could also be added to the U.S. economy by 2025.